Leila Martin, one of the five original Broadway cast members (the others are Jeff Keller, George Lee Andrews, Richard Warren Pugh and Kenneth H. Waller) still in The Phantom of the Opera, will leave the musical on Saturday, April 21. 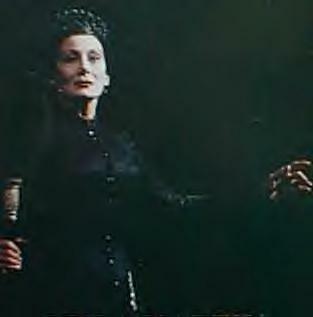 At that time she will have played over 4,500 performances in the supporting role of Madame Giry. Martin has a long history in theater. She has appeared in over a dozen Broadway shows, including The Wall and the original 42nd Street. Her other theatrical credits include Earnest in Love, The Rothschilds, West Side Story and Wings. Marilyn Caskey will assume the role of Madame Giry. Caskey is no stranger to the Broadway production, she previously played Carlotta Giudicelli in the musical. Long-time Phantom cast members, Gary Mauer and Liz McCartney will also leave the show on April 21. Chantal's note: As of this day I have only seen Ms. Martin perform the role of Madame Giry. She did not disappoint me. Her portrayal of Giry was imposing, mysterious, and finely tuned. I'm sure that many Phans as well as the Broadway cast will miss her presence.